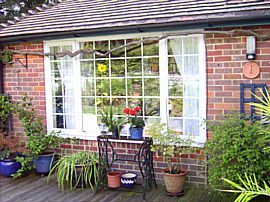 Cherry Trees B&B is located in a quiet, tree-lined cul-de-sac leading to a park and open countryside. 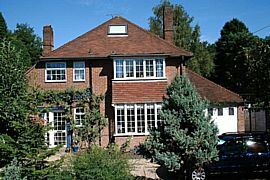 It is only a few minutes walk to shops, restaurants and the Amersham London Underground station with frequent trains. The leisure centre with swimming pool is also close by. One room on the GROUND floor with a double bed and ensuite shower room complete with shampoo and soap dispenser, and a few other toiletries to make your stay more comfortable. 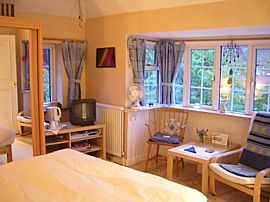 A first floor room with a kingsize bed and ensuite shower room. One single room with private bathroom with shampoo, soap and some toiletries. All bathrooms have underfloor heating and the bedrooms have tea / coffee making facilities, TV, DVD player, radio alarm clock, hair dryer etc. For our guests with laptop computers we offer a wireless broadband router for a small charge. 2 people sharing: minimum £75.00, maximum £80.00. 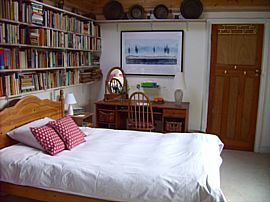 Single occupancy: minimum £50.00, maximum £55.00. Pet Facilities: Pets are allowed. By arrangement, small dogs only. We are a 10 minutes walk from Amersham London Underground Station, where you can pick up a map of the local streets.